Easy and quick database administration, natively supports MSSQL, MySQL, SQLite, Postgre SQL, MS Access. Creating and restoring backups. Transfer data between databases, tables and data files or edit database schema. Easy and quick database administration, natively supports MSSQL, MySQL, SQLite, Postgre SQL, MS Access. Creating and restoring backups. Transfer data between databases, tables and data files (supported formats are XML, CSV, HTML, Excel). 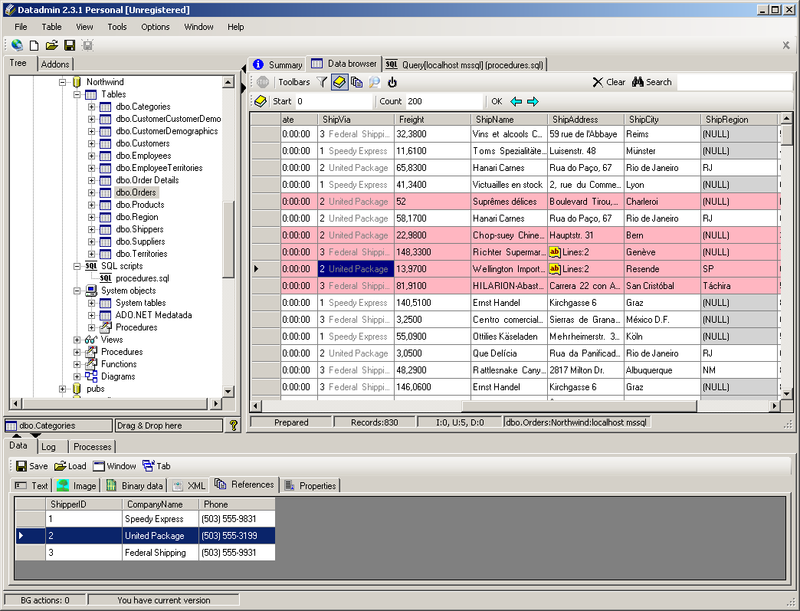 Edit database schema, tables, views, view, triggers, stored procedures. Run queries, generating query templates. View, edit, filter and sort data in tables. Display data from referenced tables. Command-line interface. Database modeling, reverse engineering. Migrate database between all supported platforms. 1. Database connection: Connection using native ADO.NET, ODBC, OLE DB drivers. Native support for Microsoft SQL Server, MySQL, Postgre SQL, SQLite, MS Access. PHP-tunnel function for connection to MySQL without direct access to the database server. 2. Database management: Tables, keys, indexes and references creation and editing. Database object management (views, procedures, functions, schemas, triggers). Support for specific database objects compatible with MySQL versions 4.x, 5.x, MS SQL 2000, 2005, 2008. 3. View and edit data: Table data editor with handy functions such as paging, filtering, searching, generating SQL for data row (UPDATE, INSERT, etc.). Display other table references, automatic master/detail views. 4. Backups, exports, imports: Database backup, export and import. Table data export/import from/into formats including CSV, TXT, HTML, XML, Excel etc. Command line support. Scheduling. Table copying by drag & drop also between different servers. 5. Database design and comparison: Database model and table structure editing. Database diagrams. Synchronization with real database, database schema comparison. 6. SQL Editor: Graphic query design, syntax highlighting. SQL query management.